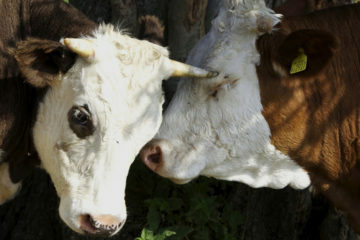 American cows are no longer vegetarian cows. They are cannibals! The dairy cow goes through many cycles in her lifetime. Today I discovered that American dairy cows are cannibals. Read on to find out why and how. drums during slaughtering process. Blood is then dried and processed into powder, then packed into 50 pound bags. Dairy farmers buy this commodity as a protein supplement to be fed to future cows and their offspring. American cows are no longer vegetarian cows. Their own blood protein is mixed with grains to feed the next generation of cows. To read more about the life cycle of a dairy cow click here. Thank you for your letter regarding the treatment of dairy cows in India. As Secretary of the European Parliament’s all party Animal Welfare Intergroup and Vice-President of the League Against Cruel Sports, animal welfare is an issue which I take very seriously. There is unfortunately very little the European Parliament can do about the treatment of dairy cows in India and the United States as the European Union has no jurisdiction in these areas. I have however brought this situation to the attention of my colleagues Neena Gill MEP, Chairwoman of the India Delegation and Peter Skinner MEP, a member of the Delegations for Relations with the United States. In the meantime, I would advise you to continue to raise awareness within the diary farming communities in India and the United States, encouraging farmers that well treated dairy cows will have better yield over a longer period of time. Please know that I will continue to work for improvements in animal welfare across the European Union. Thank you for replying Robert. Also thanks for passing my on my concerns to Neena and Peter. I really appreciate that.